Wearing school uniform is an important part of our behaviour policy. Studies show that wearing uniform aids good behaviour, gives children a sense of ident ity, confirms community membership and avoids ‘designer competition.’ Therefore parents are expected to send their children to school suitably clothed. We have a simple, inexpensive form of clothing that can be purchased at any of the large stores. The colour of our uniform is navy. 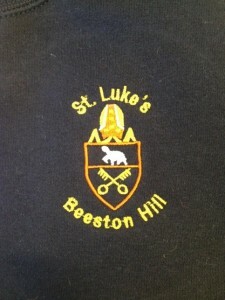 Sweat shirts, cardigans and t-shirts with the school logo embroidered on them are available to buy from the school office or the Uniform Centre. Some minor variations on the school clothing, for example, grey trousers, are allowed, but any other form of clothing such as coloured/patterned tights, track suit bottoms with stripes or brand names, hooded sweaters, designer wear etc, regardless of colour, are not allowed. Shoes are also important and flat sensible footwear is essential. Children should also be provided with a pair of pumps to change into at school. These should be kept in an appropriate pump bag. All items of clothing and footwear should be clearly marked with the owner’s name. Name tapes are also available to order at the school office. Conforming to the school dress code is considered important and where a child is not attending in the appropriate wear, they will be expected to change into clean spare clothing provided by the school. This is to avoid having to contact parents, or send them home to get changed. Children will be expected to take home borrowed items and return them as soon as possible, suitably cleaned. Click here to see our school uniform in pictures.